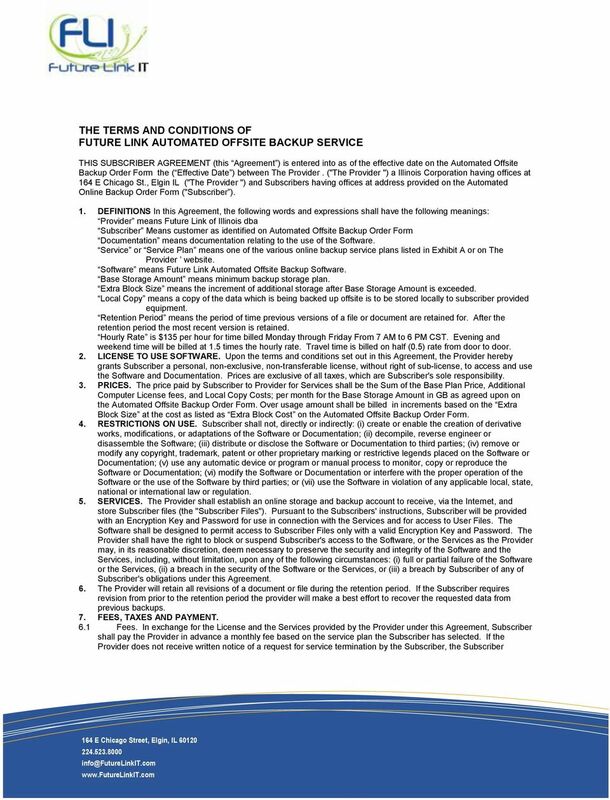 Download "THE TERMS AND CONDITIONS OF FUTURE LINK AUTOMATED OFFSITE BACKUP SERVICE"
5 subject matter hereof. 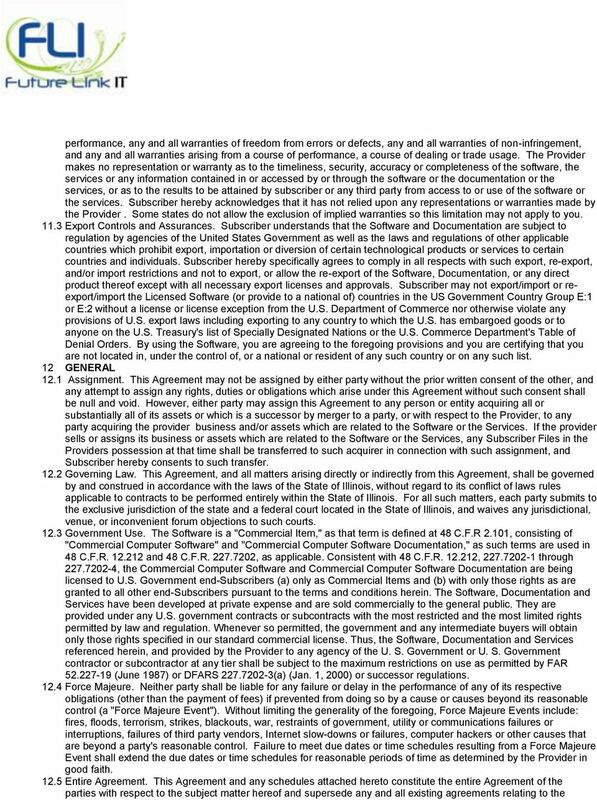 To the extent there is any conflict among the terms of this Agreement and any attached schedules, the terms of this Agreement shall control No Waiver. Neither this Agreement nor any provision hereof may be waived, modified, amended or terminated except by written agreement signed by the party affected by such waiver, modification, amendment, or termination. No failure on the part of any party to exercise and no delay in exercising any right, power or remedy under this Agreement shall operate as a waiver thereof, nor shall any single or partial exercise of any right under this Agreement preclude any other or further exercise thereof or the exercise of any other right Cumulative Remedies. No remedy conferred by any provision of this Agreement is intended to be exclusive of any other remedy, and each and every remedy shall be cumulative and shall be in addition to every other remedy given in this Agreement or existing at law or in equity, by statute or otherwise Notices. All notices and other communications required or permitted under this Agreement shall be in writing and sent by electronic mail ( ), facsimile, express or overnight delivery service, or by certified mail, postage prepaid, return receipt requested, to the address of each party set forth above, or to an alternative address designated in writing by a party.. Notices shall be effective as of the date of receipt. 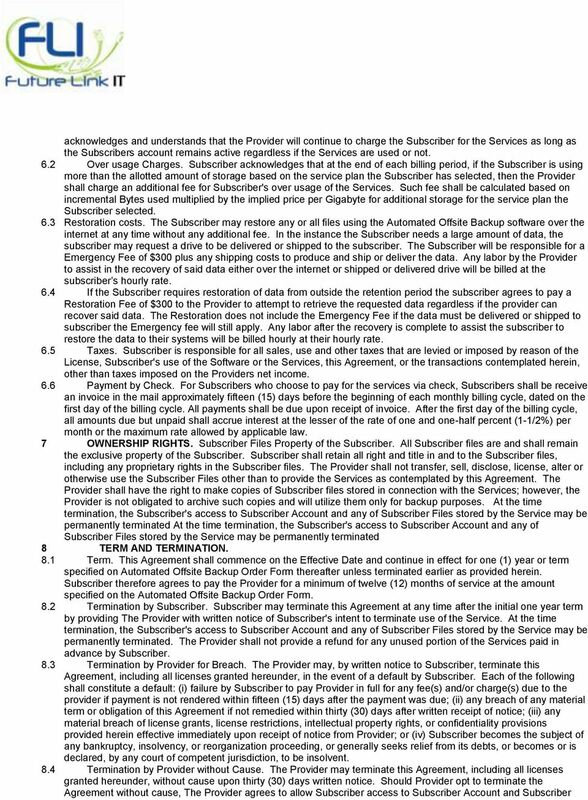 Any changes to Terms and Conditions will be noted on Subscribers invoice with in thirty (30) days of the changes to the terms Severability. If any provision of this Agreement shall be held to be illegal, invalid or unenforceable, such illegality, invalidity or unenforceability shall apply only to such provision and shall not in any manner affect or render illegal, invalid or unenforceable any other provision of this Agreement, and that provision and this Agreement generally shall be reformed, construed and enforced so as to most nearly give lawful effect to the intent of the parties as expressed in this Agreement. 13 Counterparts. This Agreement may be executed in counterparts, each of which shall be deemed an original, but which together shall constitute one and the same instrument Independent Contractors. 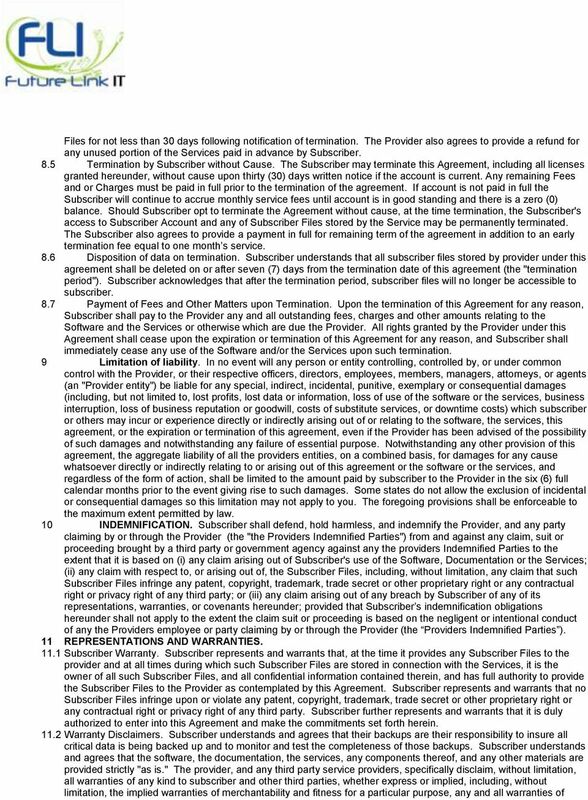 This Agreement shall create an independent contractor relationship between the Provider and Subscriber. Neither party shall have any authority to act in any way as a representative of the other, or to bind the other to any third party, except as specifically set forth herein, and the parties shall not be deemed to be partners, joint ventures or the like by virtue of the provisions hereof No Third Party Beneficiaries. This Agreement shall be binding upon and inure solely to the benefit of the parties. The parties intend that there shall be no third party beneficiaries under this Agreement, and that no person or entity, except the parties, shall have any rights or remedies under this Agreement, including the right to bring any action on account of its breach or in any relation to it whether in contract, in tort, or otherwise Headings. 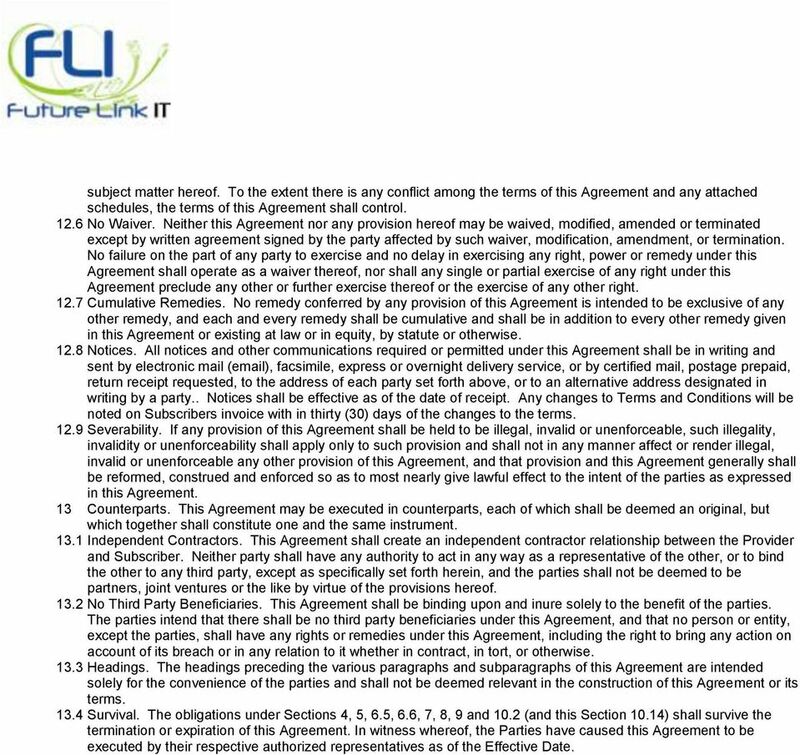 The headings preceding the various paragraphs and subparagraphs of this Agreement are intended solely for the convenience of the parties and shall not be deemed relevant in the construction of this Agreement or its terms Survival. The obligations under Sections 4, 5, 6.5, 6.6, 7, 8, 9 and 10.2 (and this Section 10.14) shall survive the termination or expiration of this Agreement. In witness whereof, the Parties have caused this Agreement to be executed by their respective authorized representatives as of the Effective Date.